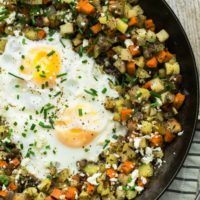 A perfect breakfast or lunch ready in 30 minutes, this hash skillet is full of root vegetables, eggs, and herbs. Dice onion, potato, turnip and carrot in a 1/4 inch dice. Finely mince garlic. Heat a skillet over medium heat. Add olive oil, followed by onion. Let cook until fragrant, about 3 to 5 minutes. Then add garlic, tarragon, and dill; cook one minute more. Add potato, turnip and carrot. Sauté 2 to 3 minutes, then add water and cover. Reduce heat to low and let steam for 8 to 10 minutes. Remove cover and let caramelize 3 to 5 minutes more. 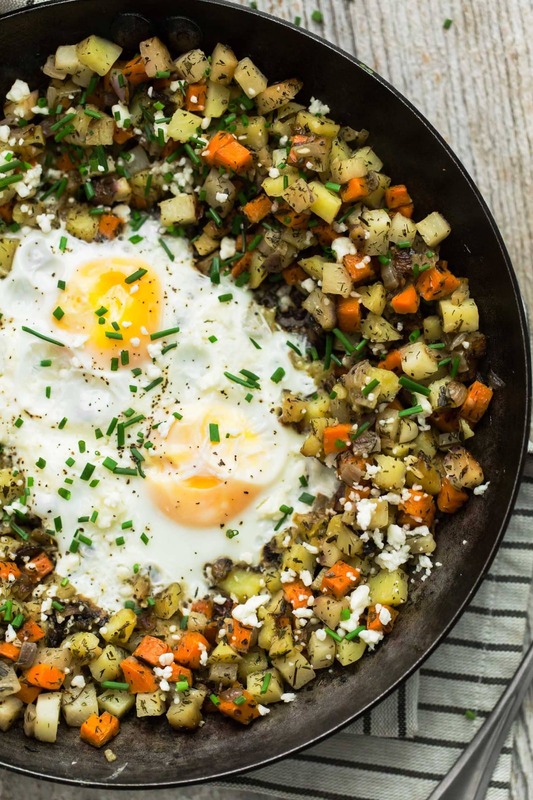 Make a small well in the middle of the vegetables and crack eggs in the middle. Cover and let cook until eggs are set but yolks are still slightly runny, about 5 to 8 minutes. Tips & Tricks: A smaller dice helps the vegetables cook more quickly. Also, be sure to cover the vegetables while they steam, it helps them cook more quickly and keeps them tender. While I would typically eat this for breakfast, you could easily turn this into a light dinner for two with a companion side salad. Also, if you’re looking to make this dairy free, simply leave out the feta. Root Vegetables: Swap out the potatoes and carrots for sweet potatoes and parsnips. 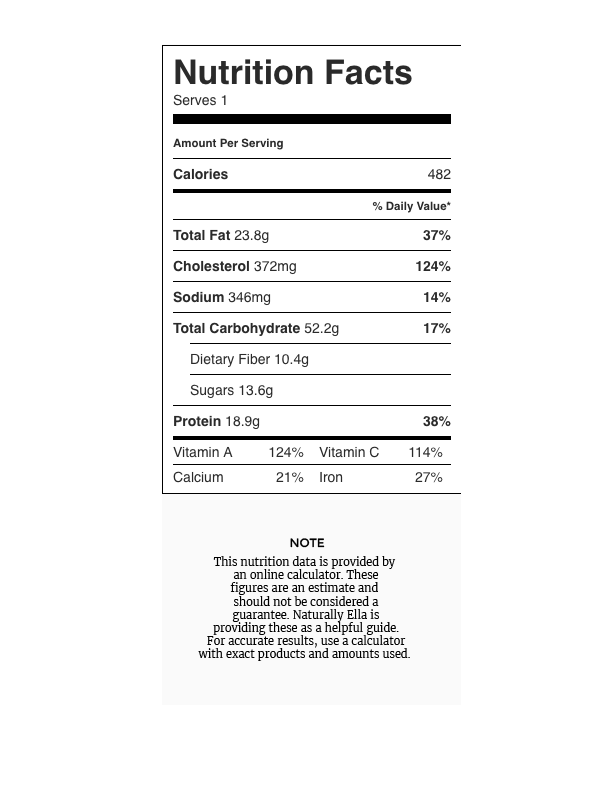 The slight sweetness complements the final flavors of the turnip. Cheese: Change up the cheese and use gorgonzola or blue cheese instead of feta. Greens: Chopped greens such as collards, kale or even broccoli would be an excellent addition to this root vegetable skillet. 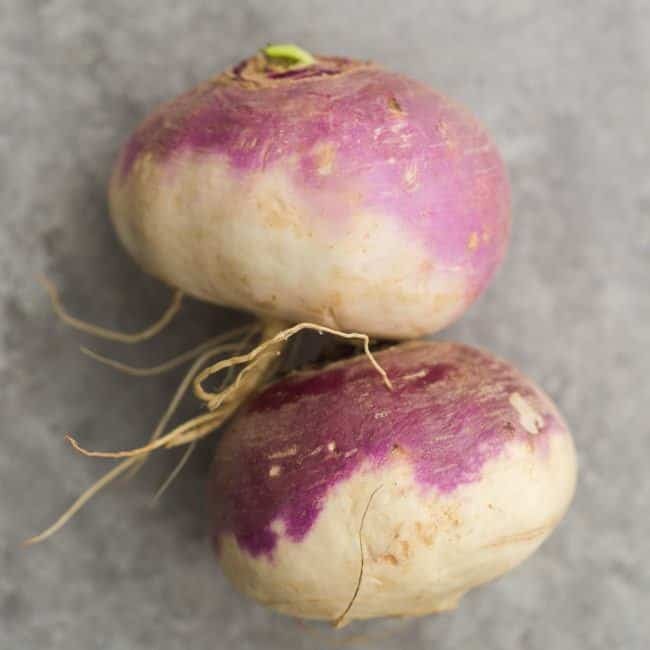 One of the things I love most about turnips is how with a bit of heat, they transition from a vegetable with a bite to one that is smooth and mellow. So, if you’re new to trying turnips, I recommend roasting cubed pieces with a drizzle of olive oil and salt. Updated- I add them with the garlic! Swapping out the potato for sweet potato sounds great. Have you tried this with mushrooms? I have not- I don’t really eat a lot of mushrooms! 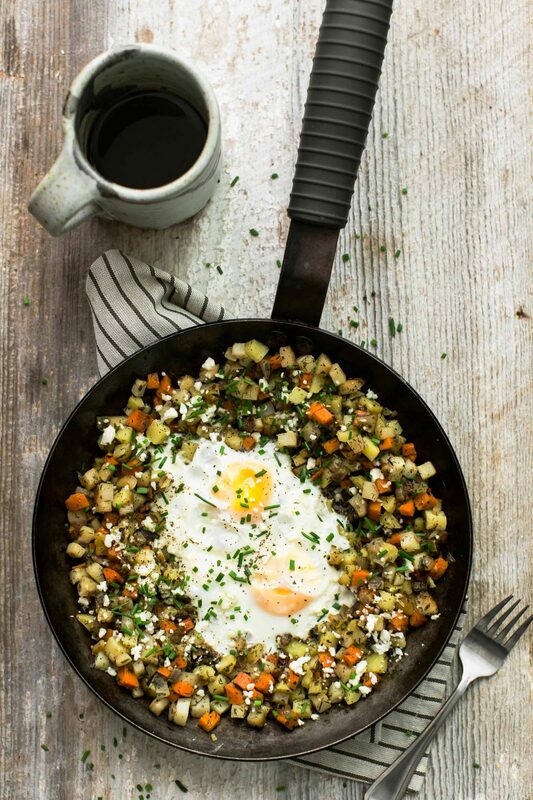 Just made this for brunch with some modifications – didn’t have tarragon and dill so used thyme, rosemary and a smoky spice mix – and added in spinach, broccoli and mushrooms. SO good. The cooking times were spot on! First time I’ve made a decent vege hash with no burnt veges. Love this blog and your photography Erin.